KIEV, Ukraine -- Ukrainian President Petro Poroshenko announced that Sen. John McCain (R-AZ) was to take up an official part-time government post in Kiev on Wednesday — apparently without clearing it with McCain, who says he never signed off on the gig. Mikheil Saakashvili (L), then Georgia’s president, presents a gold-plated pistol to Sen. John McCain (R-AZ) in Batumi, Georgia in January 2010. A decree published on Poroshenko’s website on Wednesday lists McCain as one of eight foreign members of a presidential advisory group headed by Mikheil Saakashvili, the former Georgian leader who has found a new lease of life in Ukraine as a political gadfly and government aide. McCain told BuzzFeed News, however, that he never agreed to do it. “I was asked to do it both by Ukraine and Saakashvili and I said I would be inclined to do it but I said I needed to look at all the nuances of it, whether it’s legal under our ethics and all that kind of stuff,” he told BuzzFeed News. The position would entail the former presidential candidate giving advice to the leader of a foreign power and working under Ukrainian law — an unusual step for a sitting U.S. lawmaker. Its goal is to recommend specific policy steps Ukraine should take to reform and modernize its decrepit and corrupt Soviet-era bureaucracy, as well as attract expert advice and support from abroad. Most of the group’s supposed members are former European politicians who have been vocal supporters of Ukraine’s pro-Western course. It’s not clear what Poroshenko actually okayed with any of them before publishing the decree, since each of them is listed as a council member “by agreement” — including Saakashvili, whom Poroshenko appointed head of the council by a separate decree in February. Two of the other men listed are current members of the European Parliament. A spokesperson for Ukraine’s presidential administration did not immediately return a request for comment. McCain’s proposed appointment was widely reported as fact in the Russian and Ukrainian media. McCain has been one of the loudest supporters of Poroshenko and Ukraine on Capitol Hill. In February, McCain said on CBS that he was “ashamed” of the U.S. and President Barack Obama for not doing more to help arm Ukrainian forces fighting Russia-supported separatists in the country. 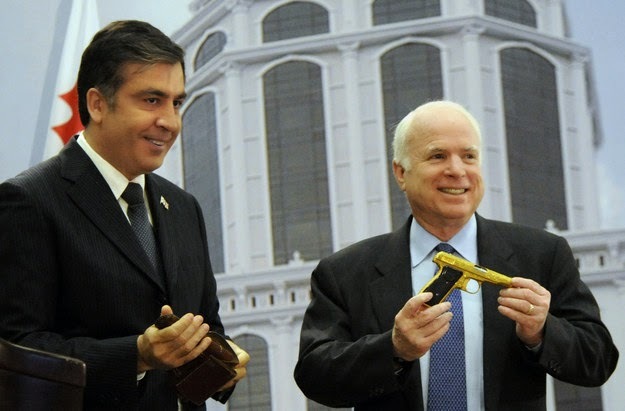 McCain is also a longtime friend of Saakashvili, whom he backed during Georgia’s short, disastrous war with Russia during his losing 2008 presidential campaign. Poroshenko conceived of the council earlier this year as a way to involve Saakashvili, 47, who won plaudits for sweeping reforms while Georgia’s president, but fled the country after leaving office in 2013 under threat of prosecution from Georgia’s new government. Since then, he has become a visible presence in Kiev, where he went to college. His modernizing efforts in Georgia ensure he remains a more popular figure there than in Washington and Brussels, where many former allies soured on his conduct during the war with Russia. In an interview with BuzzFeed News in Kiev in February, Saakashvili said the council aimed to convince international donors that Ukraine’s government was serious about major reforms. Though the U.S. and European Union continue to back Ukraine as it attempts to pull its moribund economy back from the brink of default and quell a war with Russian-backed separatists in the east of the country, ties have frayed in recent months over a perceived reluctance in Kiev to make good on pro-Western reformist rhetoric. “The thing is to bridge this gap, like, ‘Yes, yes, we shall,’ and then nothing happens, which is very post-Soviet and very Ukrainian,” Saakashvili said in February.